The AI-5620 is designed to verify and measure signals originating from a CO (central office) line card, analog PBX line, VoIP terminal adapter with FXS port, or any device utilizing a SLIC (subscriber line integrated circuit). Using a single programmable analog port, it simulates the characteristics of TE (terminal equipment) or CPE (customer premise equipment) devices. This includes the capability of presenting various DC resistance loads, AC terminations, and ringing loads. Logically the AI-5620 consists of two distinct functional elements. The first provides all the measurement capabilities of the instrument, while the second provides the ability to change physical line characteristics and generate signals. 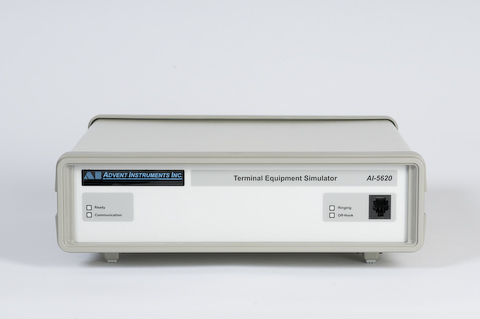 The measurement capabilities of the AI-5620 allows it to sense the differential line voltage, common mode voltage, and loop current flowing through the analog two wire port. It performs various measurements on AC signals such as RMS level, frequency, and THD+N (total harmonic distortion plus noise), with or without the use of programmable filters. Additionally it detects common telephony signals such as ringing, DTMF dialing, pulse dialing, V.23 or Bell202 FSK (for Caller ID applications), CAS/DTAS tones, and metering pulses. Sweep measurements are also available for graphing frequency response and DC line resistance characteristics. 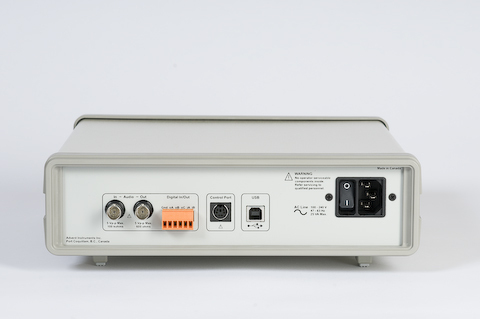 As an option to the AI-5620, AI-ET004 can capture and download waveforms representing the line voltage and loop current measured on the telephone line. This provides the ability to perform additional analysis and measurement extraction on detected signals. 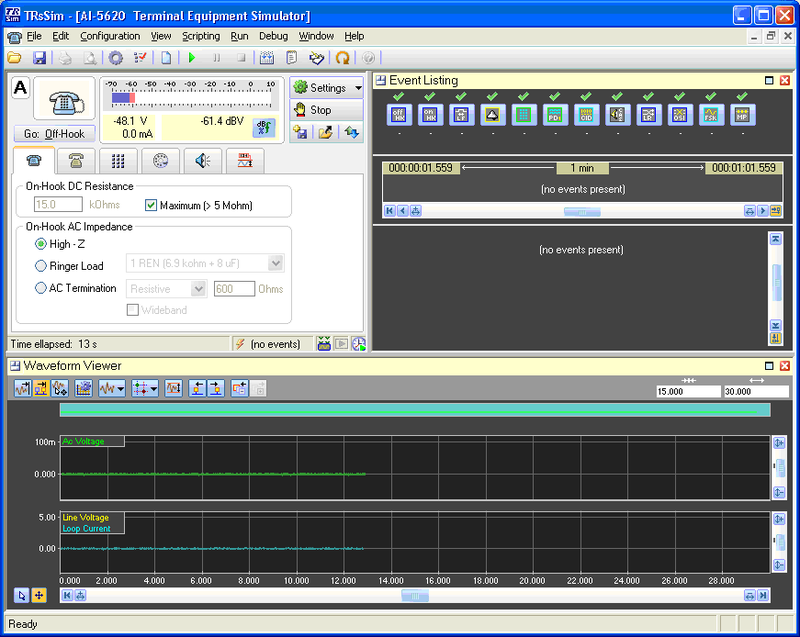 The waveform capture option also provides a live frequency domain view of the telephone line signals via a FFT analysis. The second functional element to the AI-5620 is the ability to adjust its line characteristics and generate AC signals. It provides various DC resistance settings as well as AC termination settings. The DC resistance includes a programmable range of 50 to 1000 ohms, along with a zero ohm setting. AC terminations are programmable from 200 ohms to 1000 ohms, or one of three complex impedances can be selected. Additionally, ringer loads of 1 to 6 REN may be applied to the telephone line to simulate difficult ringing conditions. The AI-5620 performs many of the same functions as a standard TE device. It can go on or off hook to draw loop current, perform pulse or DTMF dialing, generate line flashes, and support Type II (off-hook) Caller ID. It also generates FSK signals, plays wave files, or generates up to four independent tones for testing. The AI-5620 connects to the PC via a full speed (12 Mbit/s) USB 2.0 interface. Windows 2000, XP, or Vista is required to operate the supplied TRsSim software. The TRsSim software provides a high level graphical user interface for the AI-5620. When it connects to an AI-5620, it creates a window containing a wide range of controls for determining its operation and viewing collected data. The following figure shows an example of this window. The window is itself divided into sub-regions, termed 'views'. In the example above three views are present. They are the 'Status & Action' view located in the top left corner, the 'Event Listing' shown in the top right corner, and the 'Waveform Viewer' located along the bottom of the window. Measurements & Sweep Data: Displays a wide range of measurement data including graphical level meters, results from AC signal or DC resistance sweeps, and detected metering pulse statistics and measurements. Event Listing: Shows details on the telephony related events detected by the AI-5620. Each event may be included on a graphical time line showing timing relationships and a listing of detailed measurements. The type of events displayed is controlled by various filtering options which help to isolate events of interest. Chart Recorder: Graphically displays any or all of the measurement channels collected by the chart recorder. Measurements of line voltage, loop current, AC signal level, frequency, THD+N, among others are made 5 times a second and can stored for up to one week. Waveform (Added with AI-ET004 option): Displays waveforms downloaded from the AI-5620. The waveforms represent the telephone interface line voltage, loop current, and common mode voltage. Captured waveforms may be played back through the telephone interface or exported to files. FFT Display (Added with AI-ET004 option): Shows a frequency domain graph of either live downloading waveforms, or waveforms previously captured. Averaging and peak hold settings may be used to smooth out or capture transient conditions.